Besides downloading videos from 10,000+ online video sharing sites, iTube Studio for Mac also makes it possible to download media files from sharing links of online cloud storage such as Google Drive, Dropbox, One Drive, Box.com, etc. To download media files like videos, movies, music songs from sharing link of cloud storage backup providers, you need nothing but a URL address for the media file with iTube Studio! Once got the sharing link, just copy the URL address and open iTube Studio Video Downloader for Mac. Go to the main interface of iTube Studio, then click the "Paste URL" button on top left. 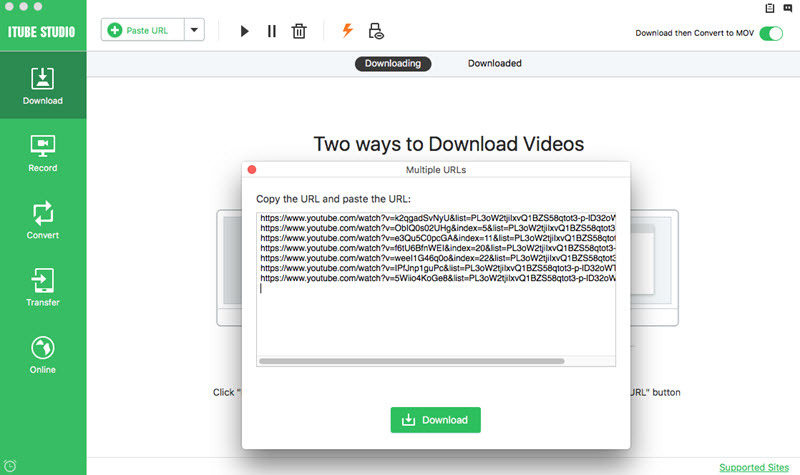 The video downloader will automatically paste the URL into the blank, and start to download the media file within seconds, which would be great help saving your time if you don't want to sign in your storage account. Notes: For the moment iTube Studio for Mac only supports to download videos and music songs from the cloud storage providers, please stay tuned for our updates in other file formats.